UpWalker Reviews - Is it a Scam or Legit? The UPWalker is a mobility enhancer that claims to help you walk upright with better posture, less pain, and more security, due to its elevated, adaptable design. The device promises to help you regain your independence, allowing you to maintain a more active lifestyle both indoors and out. The UPWalker frame weighs in at 23 pounds and folds up for storage and transportation. It features soft, adjustable-height armrests and a sliding chair with built-in back support, allowing you to sit comfortably and make the transition from sitting to standing more easily. To that end, it also features an easy locking handbrake system that allows you to come to a stop or park the walker whenever needed. The manufacturer states that the UPWalker is designed to help those with mobility issues, including people living with neurological, orthopedic, cardiovascular and other health disorders, providing them with a more effective method of getting around, while also restoring dignity in the process. Specifically, the company claims that it addresses the shortcomings of traditional walkers, including the risk of falling, slouching, and a general lack of confidence and comfort. Is this really what you can expect, however? 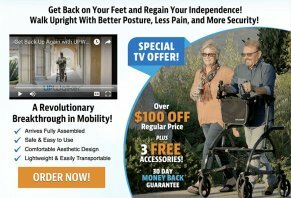 Will the UPWalker Really Cause Less Pain & Discomfort Than a Traditional Walker? The makers of the UPWalker state that the device’s unique design allows it to provide a more comfortable and secure walking experience, leading to less strain on the wrists and hands, especially for those dealing with arthritis. The website reports that a laboratory-based research study was carried out with 30 walker users who tried out the LifeWalker Upright (a previous but functionally similar model of the UPWalker), who stated that the product enabled them to walk fully upright, resulting in better overall back posture. We’re also told that users felt a greater sense of safety and stability when using the device as compared to a conventional rollator or walker. Finally, they assert that the forearm support on the product allowed users to offload weight on the wrists and joints, leading to a more comfortable experience that was easier on the body. Despite these optimistic reports, the actual study itself is not linked, and we did not encounter it published on third-party websites during our research. We left a message with the staff at Shirley Ryan Ability Lab/Rehabilitation Institute of Chicago where the study is listed as originating from, but hadn’t received a response as of publishing. As soon as we do, we’ll be sure to update this article accordingly. So, what does all of this mean for you? On the surface, we can see how the raised design and forearm support central to the UPWalker’s construction could potentially enable users to feel more comfortable and secure when out and about, and we can even envision the device helping certain users to regain some degree of their independence, as claimed by the manufacturer. For instance, if you are dealing with arthritis or chronic back pain, it would reasonably follow that a walker capable of taking pressure away from these crucial areas would allow for a boost to mobility, as well as a reduction in overall pain, as described on the product’s website. Of course, this likely isn’t the case for everyone, but we could also imagine the UPWalker’s design to be more comfortable and enjoyable for many who simply prefer walking without the “hunched-over” posture that comes along with more conventional devices. Without testing the product for ourselves (or having actual clinical data to point to), we can’t state with certainty that this is what you’ll experience using it for yourself. All the same, judging purely based on of the information we’re given, it looks as though the potential is there for users dealing with mobility issues to have a better experience overall with the UPWalker. As of this writing, the UPWalker is available exclusively online from the manufacturer’s website. It is sold for $495, and shipping and handling are free, except to Hawaii and Alaska, which will run you an extra $130. The FAQ page states that the UPWalker is sold as a cash pay product, and recommends reaching out to insurers directly to discuss reimbursement. Each order placed on the website comes with a 30-day satisfaction guarantee, including initial shipping and handling fees if they were paid. Before initiating a return, you’ll need to reach out to customer service at 877-488-0822 or via email at customerservice@lifewalkermobility.com to obtain authorization. You’ll be required to pay any shipping fees associated with the return, which could be anywhere in the range of $40 to $100 and up, depending on where you are located. The terms state that all returns must be in a “like-new” state, and returned in their original packaging to qualify for a refund. Are There Any Alternatives to the UPWalker? The UPWalker certainly appears to provide some unique functionality, but does the product truly feature a breakthrough, revolutionary design as the manufacturer claims it to be? During our research on Google and Amazon, we didn’t encounter any other products that had identical designs to the UPWalker. What we were able to find, however, were a few different walkers that claimed to be able to support a more upright walking position, similar to one of the UPWalker’s main claims. The most comparable product we encountered during our research was called the Motivo, and it appeared to be coming sometime in 2018. It features a highly similar “upright” design position and also includes a more stylized look with a solid, pre-assembled construction. Beyond these similarities, the product also folds for easy transport and includes a storage area and drink compartment, just as the UPWalker does. In addition to these, however, the device also includes several unique functions, such as a flip-out tray table, cane holder, narrow turn radius and a speed control system to avoid runaways on downhill surfaces. These additional features come at an added cost, however, as the product is currently listed at $549.00. Ultimately, your choice of walker should come down to the features and design that best suit your unique lifestyle. If you frequently carry a cane, or deal with uneven terrain, or just really enjoy the aesthetic design, the Motivo might be worth the additional funds for you. If all you’re looking for is the ability to walk in a more upright position, however, you could feasibly save some money by going with the UPWalker. Based on what we’ve learned about the UPWalker, can you truly expect it to help you regain your independence by enabling you to stand more upright, and in a more comfortable position relative to more conventional walkers? In short, we feel that the answer is likely yes, depending upon your specific needs. If you find that traditional walkers and rollators cause you increased pain due to slouching, or due to pressure on the wrists and lower extremities, the UPWalker may indeed be able to offer a more comfortable experience for you. That said, we did not encounter the actual clinical study referenced frequently on the manufacturer’s website during our research, and without testing the device for ourselves, we can’t fully state that it will work as described. There’s also the matter of the competition with products like the Motivo. While not available until 2018, the walker has several unique features that might justify the extra expenditures, depending on what you’re looking for. All said, if you opt for the UPWalker, be sure to keep the 30-day return policy in mind. If you try the product out and decide that it isn’t right for you, you’ll be able to return it, as long as you’re willing to potentially lose out on a decent chunk of change in return shipping fees (remember, it weighs 23 pounds and is oversized) in the process. Have you used the UPWalker yourself? Leave a review below and share your thoughts with other Highya readers. The UpWalker is too cumbersome for me when I go to the gym and for use on cruise ships. It is not easy to use around the house and is bulky to put in a vehicle. In comparison with a Rollator, it is harder to maneuver and lift to store. My elderly landlord purchased one. I have no idea what they told him to get him to buy one but it's so huge as to be practically useless for getting around in the home & we live in a very large old Victorian. Getting in touch with the company for returns has proven to be very difficult & the amount in return shipping charges are astronomical. 1/3 of the cost to send it back is quite the “Try-out fee”. Don't ever do this! I ordered this as a gift for my arthritic Dad. I am SO disappointed. The commercial looked great and the taller height made sense. The quality is poor, it is NOT sturdy. It is heavy for a senior to lift in and out of the car. The seat does not lock into place, when you turn it the seat lifts. The idea is great, BUT the product is NOT! There is also a fee for UPS to come retrieve it for return. It can work outdoors too. Big for inside use, won't fit in a 30-inch door. It took two hours to put back in the box it came in. I sent it back by USPS; it cost $185.00. UPS was $190.00. They don't give return free shipping. On August 14, 2018, LifeWalker shipped an upright walker to my 95-year-old mother. She tried to use it for several days, but it was too wide and cumbersome for her. It is a well-made device, but she just could not use it. On August 28th, I emailed LifeWalker for a return authorization, and over the last two weeks I have sent two emails, one USPS Priority Letter and a Facebook request for a return. Clearly customer service after the sale does not happen. I will protest the credit card payment, and get my money back, but a simple response to my four communications is all that is needed. I can recommend the product, but if you need service, I can't recommend the company. A really good idea but improvements to the design are needed. Mom was able to try out the walker at a retailer and found that, for walking, it was very comfortable for her and likely would have been better than her standard walker. However, Mom needs to sit every so often and relies on her walker for sitting when comfortable seating is not available. The SEAT design of the UpWalker is too narrow for her, the back support does not allow her to do much more than a "perch" on the seat, and the arms cannot be moved out of the way for sitting. I've tried for weeks to use this walker. It's just too damn big for in-home use. I've scratched up doors and baseboards. The seat is useless, especially when you have to lock the brake to stand up. The brake handles are behind you, impossible to set, plus the seat won’t stay put. Good for walking, if you're in your yard. That’s when I use my electric scooter. And $500? Get real people. This is ridiculous. I pay for all my equipment, thank you very much, I don’t ask for assistance like most people do! My wife got this for me thinking it would be useful; God bless her. Thanks honey, no thanks UpWalker! I have only had this walker about a month. I saw it on TV and asked my surgeon about it. Though not familiar with it, my doctor said anything that keeps me more upright was worth a try. I had 16 vertebrae fused. It took me a while to figure out the best height. I like that there are so many height choices. I like that you can sit on it. It feels sturdy. I also like the beverage holder and the pouch. However, I felt the advertising about the $100 off was misleading. I expected $100 off the $595 price not free shipping and a pouch and a beverage holder instead. If you watch the commercials carefully, you never see the walker on a carpet. I find it harder to push on carpet. Also when the walker is going over the step, you do not see the upper part of the Parkinson's disease walker's body when it goes over the step to see what he is doing to have it go over the step. I have found it difficult to go over steps. It is very important that you walk with your body in the walker proper. My physical therapist said my knees should touch the back band as I walk. It is easy to fold up but depending upon your affliction, it is not that easy to lift. With my back surgery, I cannot lift it at all. It shipped quickly. Though assembled there are quite a number of adjustments that needed to be made. I couldn't have done them myself due to my back surgery. When I finally receive it, I will think long and hard before I decide to keep it. Write a Review for UpWalker!